WHERE THE CONTRACTOR & CUSTOMER BECOME UNITED IN ROOFING, SIDING, TRIM AND WINDOWS PROMISES MADE... PROMISES KEPT! Family Owned and Operated Since 1989Ask About 0% APR for 48-60 Months! 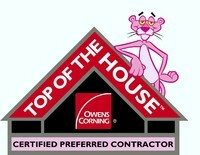 Owens Cornings has strict standards for becoming a Roofing Platinum Preferred Contractor. Homeowners everywhere rely on their roofs to keep their families safe and dry. But if your roof has suffered damages, it can't protect you. It's crucial to call in a professional right away - and Premier Roofing & Siding Contractors is here to help! We have over 25 years of experience offering exceptional, cost-effective roof repair, roof replacement, vinyl siding, and replacement window services to local home and business owners. A family-owned and operated company ever since the day we opened, Premier Roofing & Siding Contractors knows how to treat our customers to dedicated craftsmanship and customer service. Our two offices in Southside Virginia and Peninsula Virginia were built to better serve our customers. We also do all of our work ourselves, meaning you don't have to get to know any subcontractors. Take a look around our site, and if you think it's time to fix your roof, siding, or windows, schedule a free estimate with us today! We serve homeowners in Virginia Beach, Chesapeake, Newport News and nearby areas. Get a FREE Roof Replacement, Repair, or Siding Quote Now! If you're not having your roof checked and repaired regularly, you can dramatically increase its rate of decay. Premier Roofing & Siding Contractors can quickly determine what's wrong with your roof and offer the best course of action. All of our roof repair and replacement services utilize industry-leading products with extensive warranties. Vinyl siding is one of the most popular choices for a home's exterior, and it's not hard to see why. This maintenance-free siding is resistant to moisture and mold and comes in a variety of colors. We can install siding that best suits your needs! We also offer energy-efficient replacement windows to add value, comfort, and aesthetic appeal to your home. Ask about our window materials and styles! The longer you wait to complete work on your roof, the more danger your home will be in and more costly the repairs will become. Whether your home has suffered extensive damage in a storm or if small problems have emerged over time, our fully trained and certified technicians are more than qualified to take care of you! Ready to get started on your roofing, siding, or window project? Call us at 1-757-543-8958 or contact us online today to schedule a free estimate! We offer our services to residential customers in Chesapeake, Virginia Beach, Newport News, Norfolk, Hampton, Williamsburg, Suffolk, Portsmouth , Yorktown, Elizabeth City, and surrounding areas.